China likes everything big. After years of strenuous construction, this week world's longest sea bridge opened, detects how tired you are. Engineering wonder or collosal waste of money? One of the most identifiable features of China is size. The huge population, the sprawling area, and the mass production. Now they can also boast of building the world's largest sea bridge. 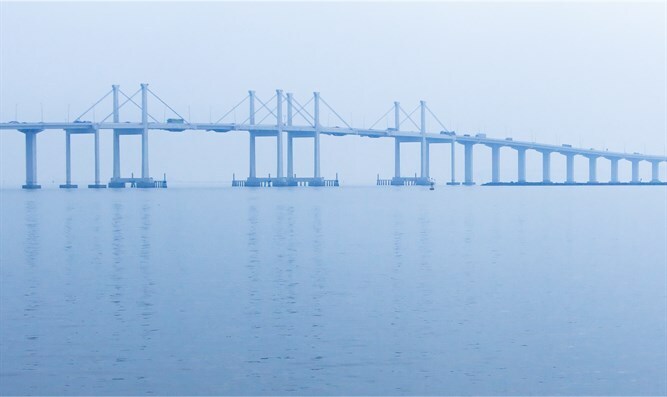 The bridge, 55 km long, was raised from the seabed in giant columns and connects Hong Kong to the Macao Peninsula, which is located in China. Construction began nine years ago, but due to budget and safety problems (the death of construction workers who worked on it) the opening was postponed until this week. It is built of 400,000 tons of steel, and passes through two huge artificial islands, 100,000 square meters in size, connected by an underground, underwater tunnel. Bridge manufacturers also added technology to help identify tired drivers. The bridge is equipped along its length with cameras that test whether drivers yawn and how often. A driver caught yawning three times in a twenty-minute period is defined as a tired driver and the "yawn camera" will summon the authorities. But before you fly to China to see this wonder - you should know that special permits are needed to use it. Although much of the cost of the bridge was built from Hong Kong residents' money, only those who donate large sums to Chinese organizations or a senior official in China may cross the bridge. Another problem with the bridge is trip direction. While in Hong Kong they drive on the left side of the street, in China they drive on the right. To solve the problem, bridge planners added an empty area where cars could turn round and reach the right side. It's not so clear why such a huge bridge is needed when only a few people can travel on it, but in the meantime you can see the amazing engineering marvel.